"Your experience and knowledge in the construction business has made the building of our dream home a pleasant experience for my wife and I." "You made sure that from the very beginning, we were involved and informed in all aspects of the construction process. At every step, we felt that you were looking to meet all of our objectives. " 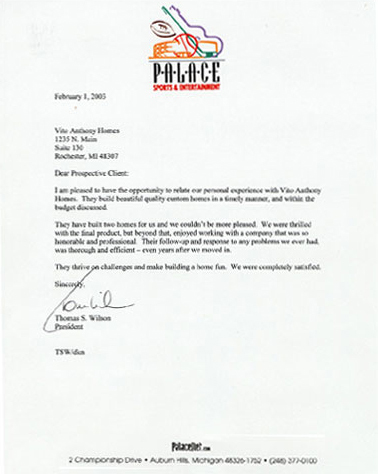 "Vito Anthony Homes has built two homes for us and we couldn’t be more pleased. We were thrilled with the final product, but beyond that, enjoyed working with a company that was so honorable and professional. Their follow-up and response to any problems we ever had was thorough and efficient – even years after we moved in."